As your baby grows into an energetic toddler they could start getting bored and restless in the pram, which is where the Smart Trike Dream 4-in-1 comes in. Sonny loves his, and so do I. This trike is a sort of halfway house between a pram and fully-blown trike, with the added bonus that when you don’t want to push it around any more it does actually convert into a fully-blown trike. We’ve been using the Smart Trike Dream since Sonny turned one, and here’s my impressions so far. It looks awesome. In my opinion Sonny’s already the coolest kid to ever walk the Earth, but in this thing he looks almost presidential. The gold and black design makes this trike stand apart from the usual bright baby colours – making any toddler who rides it the biggest player on three wheels. It’s very easy to assemble. The Smart Trike Dream comes packed away in a box and so is broken down into a few different pieces, but you don’t need any tools to assemble it and the instructions are simple. Took me about 5-10 minutes. It’s got longevity. 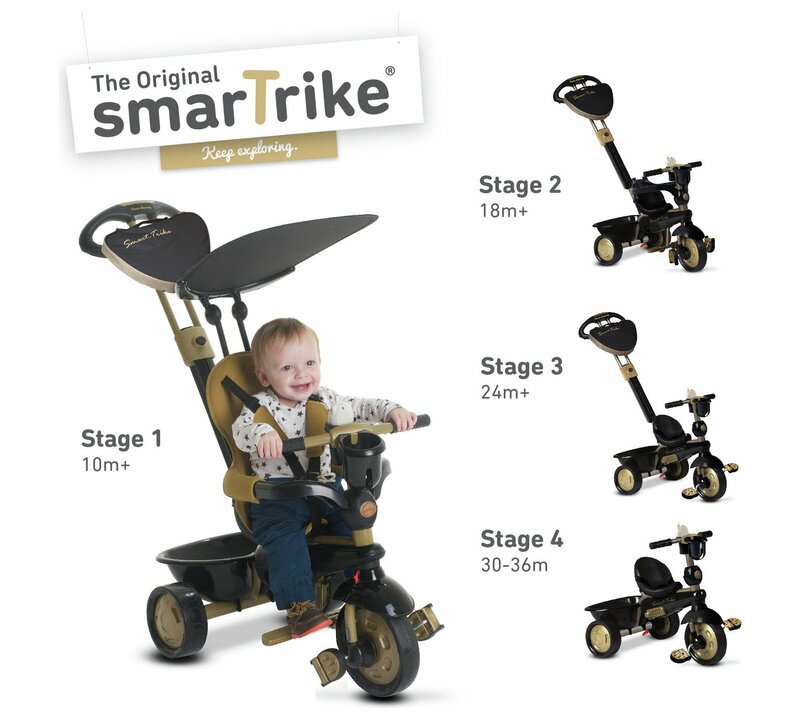 You can adapt the Smart Trike Dream depending on your child’s age, with different set-ups for 10m+, 18m+, 24m+ and 30-36m. When you first start with a baby/toddler it has a big padded seat with shoulder straps, a baby foot rest to keep their feet away from the pedals, plus a sun shade and steering handlebar for parents; but as you move upwards through the ages you remove the relevant features until it becomes a stripped back tricycle. It’s easy to steer. The ‘touch steering technology’, makes the Smart Trike very easy to manoeuvre. Unlike a pram that you have to wrestle with to go round a simple corner, just a little flick of your wrist will turn it. You can also easily steer it one-handed – perfect if you’re walking a dog at the same time. It’s got loads of accessories. The sun shade is vital for hot days, the battery-powered toy phone keeps Sonny entertained on long walks, the drinks holder helps keep Sonny (or me) hydrated and the two storage compartments (one below the seat, one on the parent handlebar) mean you can keep your hands free to steer. It’s exciting for your kid. Sonny gets bored very easily in his pram, but sitting upright in this trike keeps him happy for ages. He gets genuinely excited every time we put him in the Smart Trike Dream, and loves it even more when we race around the park, slaloming between trees and pulling wheelies. Now I can’t wait until he can pedal and steer it properly himself! It’s expensive. When you’ve already forked out hundreds on a pram and a baby carrier, and will no doubt be doing the same for a bike in a year or two, the toughest thing is justifying another £90 on something like this. But we use the Smart Trike Dream every single day for things like nursery drop-offs and dog walks, so to us it’s been worth the outlay. No chance of sleep! Sonny still enjoys an afternoon snooze in his pram, but you can forget all about that in a trike. There’s no reclining position so unless your toddler likes sleeping bolt upright then it’s not going to happen. The sun shade is a bit loose. Hopefully I just have a dodgy product rather than this being a full-on design flaw, but the sun shade on our trike tends to flap about with anything more than a gentle breeze. I can fix it by tightening the screw every few weeks but it usually loosens again with time, which is a little bit annoying. We bought it as a bit of fun for our one-year-old and now it’s almost fully replaced his pram. We love it, he loves it – I’d recommend it to anyone.